The buffalo demon, Mahishashur, performed tapasya and for his efforts he received a boon from Brahma that no man or god would be able to kill him. Full of power, he attacked the gods and captured heaven. The gods had to come down and wander about on earth. They were very angry at their condition and their faces began to glow. The light took the shape of a goddess, Durga. Each of the gods gave her a weapon. Himalaya gave her a lion . Riding the lion she began to roar. Mahishashur came out of his palace on hearing the roar. Durga killed his army of demons. Mahisha took many forms, but she defeated all of them. Finally, he took the form of a buffalo and attacked her. 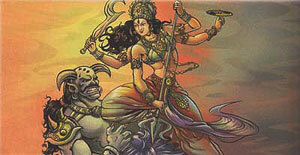 Durga killed Mahishashur with her trishula, and today she is worshipped as goddess Durga.